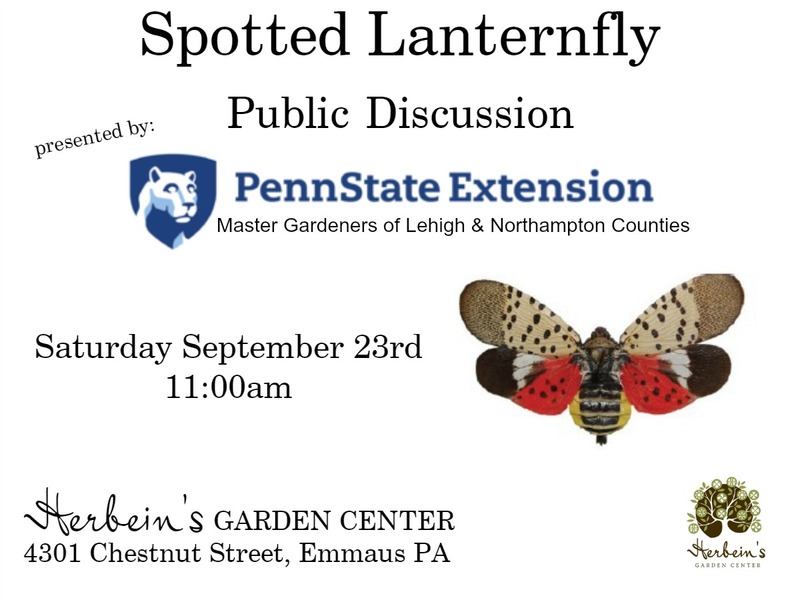 I am very happy to announce that we will have a Special Public Discussion about the Spotted Lanternfly here at Herbein’s Garden Center THIS SATURDAY, September 23rd at 11:00am. Please plan to attend this important meeting being presented to us by the Penn State Extension Master Gardeners of Lehigh & Northampton Counties. You’ll be able to hear the newest information available on this daunting agricultural pest, what actions have been taken so far, and what is being planned for the future. I know that MANY people are asking “what can I do?” , “where did they come from?”, “why are we just now hearing about them?”, and…”there’s no hope”. If you’d like to find out more, please stop in. This is a casual presentation. Bring a notepad & pen! See you there! Hi will this discussion be videotaped so that others can participate remotely, tune in later and/or disseminate to our concerned tree people networks? We will try to have this discussion posted live on our Facebook page and later on Youtube. Thank you for your concern in the matter, the SLF are running rampant locally. I’m hoping this discussion will help to answer many questions that are being raised in the community. We appreciate your bringing us this information. Where can we see the details of the conference? Unfortunately we were unable to video this discussion.